Mincidetox Laboratories PILEJE, red fruits, is a food Supplement that can detoxify your body to contribute to the comfort and lightness of your legs while balancing your nutritional intake during a diet. 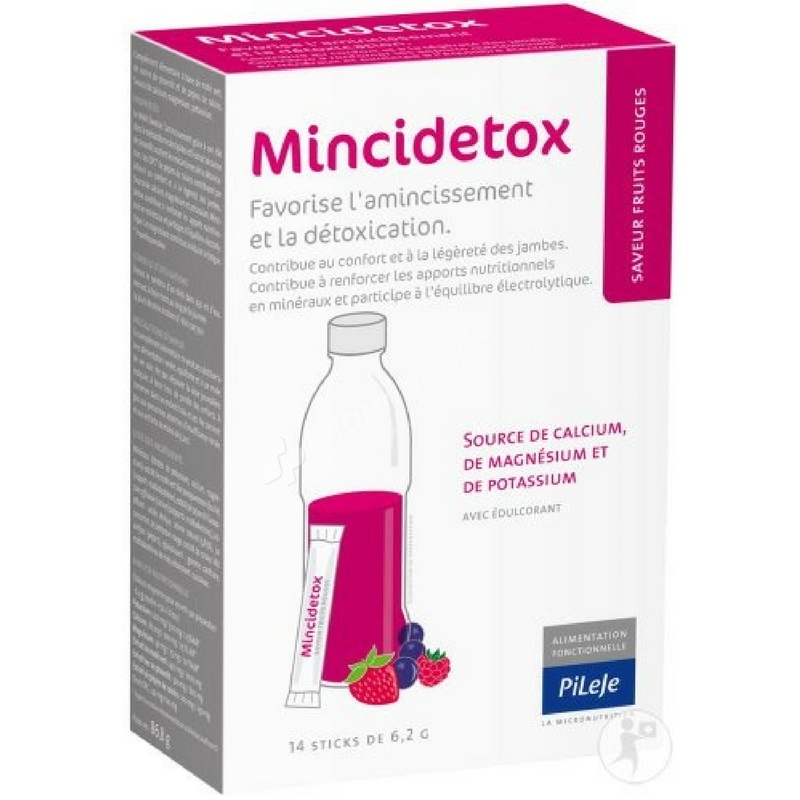 Food Supplement Mincidetox Laboratories PILEJE, red fruits, can detoxify your body to contribute to the comfort and lightness of your legs while balancing your nutritional intake during a diet. The Maté Green: This plant favors slimming silhouette by controlling lipid metabolism, but its caffeine content is also interesting to offer better resistance to fatigue. Extract Dandelion Root: It stimulates and energizes the detoxification of the body and increases the volume of urine by a diuretic which helps eliminate waste and toxins. OPC Grapeseed: These are proanthocyanidins, which involved the strengthening of blood vessels in the legs and thereby contribute to their comfort and lightness. A pair of Potassium, Calcium and Magnesium: These minerals are balanced nutritional intake and participate in electrolyte balance, but also reduce fatigue. A Red Fruit Flavor: The delicious taste of red fruit, gives you a sweet and refreshing drink. This device helps you in your weight loss goal by promoting the elimination of waste and toxins while balancing your nutritional intake: your legs are light and airy and your body finds an intense feeling of comfort without the customary fatigue. Dilute a stick in 250 ml of water and drink during the day. garcinia cambogia extract (fruit rind), potassium citrate, tricalcium citrate, magnesium citrate, dried extract of dandelion taraxacum officinale (root) (corn maltodextrin), thickener: guar gum, red beet juice concentrate (maltodextrin, acid citric), natural blackcurrant flavor (gum arabic, corn maltodextrin) (.%), extract of grape vitis vinifera (seed), acidity regulator: citric acid and malic acid, sweetener: sucralose.